When the sun comes up, head to this local bakery. The front door is propped open. The screen door creaks. When you walk into Sunup Bakery, it feels like coming home. And that’s just how owner Laura McKenna wants it. Sunup is quaint and cozy, with a very friendly staff. Menus are scrawled on chalkboards. The floors are wooden, and so are the ceilings. There’s a stand-up cooler with water, yogurt and juice. If you want to get your black coffee yourself, you can. If you want to order it fancier from the full-service counter, you can do that, too. Seating is minimal inside and outside on the porch. What Sunup does best is healthy and delicious food – to go! But if you want to sit a bit, there’s a picnic table outside for additional space. There’s also Wi-Fi, and fun 80s and 90s hits playing loud enough to hum along. Head to the porch for a mountain view, where you can watch the traffic ramble by or catch up on local gossip. Sunup serves breakfast all day, as well as lunch. They understand you’re eager to hit the slopes on Killington mountain, so you can get in-and-out with a fresh meal in a jiffy. Get here early – some items sell out before 9 a.m. The Chocolate Espresso Bread Pudding is a crowd favorite, and it does not disappoint. Crunchy on the outside, it melts in your mouth when you get to the middle. (A perfect way to start your day, if we do say so ourselves.) We also sampled the Green Mountain Smokehouse – a bacon, egg and cheese sandwich on warm, homemade bread, toasted and flaky in all the right ways. Sunup partners with local farmers as part of the Vermont Fresh Network, so they use all local dairy, eggs, flour and produce – and they tend to stick to what’s in season. When we visited, blueberries were ripe for the picking. So the blueberry scone we ordered was so perfect, we didn’t even need to dip it in our coffee. 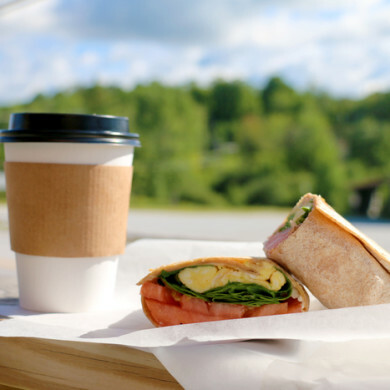 Sunup Bakery is located at 2250 Killington Road in Killington, VT. 802.422.3865. Another quick and hearty breakfast spot on the access road is the Back Country Cafe. True to its name, it’s a rustic mountain diner with an open kitchen. So open in fact, if you grab a seat at the bar, you can watch as your breakfast is prepared. Speaking of the bar, it’s really long – with 20 seats. So grab a stool, and get to know the locals. That’s the best way to learn about all the cool things you should do after breakfast. Even though it has a small-town diner feel, there are also around 25 to 30 tables, so you shouldn’t have trouble filling your belly before you hit the slopes. The smell of bacon wafts through the crisp Killington Mountain air the minute you step out of your car. Inside, you’ll find deer heads and frying pans set the tone for a true ‘lumberjack breakfast’. Skiers and serious eaters, take heed – special menu items are labeled double black diamond (for experts only). Order these if you are extra hungry in the morning. The food comes out quick, and it is delicious. Ask for your bacon extra crispy, because this place does bacon right. They have all your basic comfort food choices – from pancakes to waffles and eggs. We tried the VT French Toast, homemade bread dipped in egg custard with Vermont maple syrup. When blueberries are in season, don’t pass up the blueberry pancakes. Word to the wise: if you’re not a morning person, perk up with a coffee before you order. There’s a warning sign on the wall promising a $25 charge to deal with grumps. Back Country Cafe is located at 923 Killington Road in Killington VT. For more information, call (802) 422-4411.